Hatha is the yoga of balance – the combination of sun and moon, says teacher Ali Tilley. I have joined 12 other women for her yoga class in Marton on a Tuesday morning and, after stretching a few muscles I haven’t been using for a while, I’m enjoying the breathing exercises. Before the class started, we were asked to say what we wished to focus on during the next hour. Core strength, breathing, stress management, emotional strength, knees, hips, ankles – everyone in the class had a specific body part or emotion they wanted to work on. It had been around 10 years since I last participated in a yoga class and, although I find some of the postures a bit challenging, I feel thoroughly relaxed – enjoying Tilley’s gentle encouragement and the company of the other women. Master teacher Tilley arrived in Marton a year ago after running her Sadhana Yoga Centre in Wellington for 10 years. “Wellington prices had gone through the roof, and I decided this was my opportunity for a positive change,” she said. 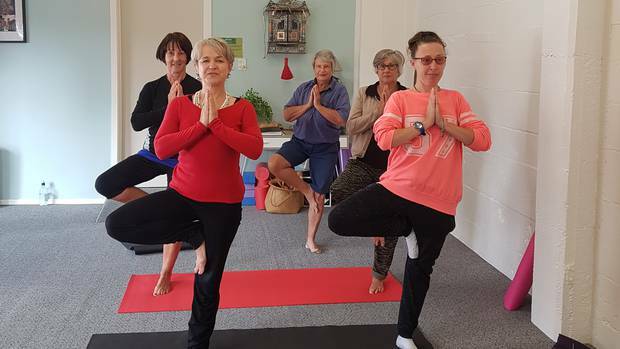 The New Zealand Yoga Centre on the corner of Marton’s High and Stewart Streets has a welcoming outdoor area with seating and containers of flowering plants and fragrant herbs. Inside, the room is scented with essential oils and Tilley brings bottles of oils round during the class and places drops on our palms so we can massage them in to our palms and breathe in the soothing vapours. Sometimes she issues special encouragement to individual class members if she knows there are particular postures they might be trying to master. Class member Trudy says she has been coming since the classes began and realised that Marton had scored a great teacher. Other students said they have been coming for a few months and have seen an increase in their strength and flexibility. “I’m now doing stretches I thought I would never do when I first came,” says Judith. Tilley says the Marton community has warmly welcomed her and the people are genuine and kind. “I keep my prices low and I’m rewarded with gifts like the fresh broccoli I was given this morning,” she says. She holds classes every day but Friday and caters for all levels from a masterclass on Saturdays to a beginners’ class on Tuesday evening and there is a children’s class on Wednesday afternoons. Tilley will be celebrating her first year in Marton and the first birthday of the yoga centre with a potluck dinner and gathering next weekend. Ali Tilley can be contacted at nzyogacentre@gmail.com or by calling 06 327 4108.